Goods and Service Tax Collection in India went up by 15.6% from a year ago to hit INR 1.06 trillion in March. GST Council has been working diligently towards a fairer taxation system and reduce tax evasion. One such crucial measure taken by the council is Reverse Charge Mechanism. GST is normally charged by Supplier of Goods/Services. Supplier is liable to collect tax from the recipient and pay the total tax amount to the Government. But in some cases, the Recipient of Goods/Services is liable to pay GST instead of Supplier. This is in essence Reverse Charge. When is RCM under GST applicable? The reverse charge mechanism is applicable upon the nature of the given goods/services as notified by CBIC which will be covered under RCM. This scenario is covered by section 9 (3) of the CGST/SGST (UTGST) Act and section 5 (3) of the IGST Act. Any service supplied by any person who is located in a non-taxable territory to any person other than nontaxable online recipient. Any person located in the taxable territory other than nontaxable online recipient. (ii) services in relation to an aircraft or a vessel, inside or outside the precincts of a port oran airport (iii) transport of goods or passengers. Services supplied by the Central Government, State Government, Union territory or local authority by way of renting of immovable property to a person registered under theCentral Goods and Services Tax Act, 2017 (12 of 2017). As per section 9 (4) of the CGST/SGST (UTGST) Act and section 5 (4) of the IGST Act, if a registered person purchases goods/services from an unregistered dealer (URD) then the registered taxpayer is liable to pay GST on reverse charge basis( only for certain goods/services). All the provisions of the Act will apply to such recipient as if he were the person liable for paying the tax in relation to the supply of goods or services. An e-commerce operator that provides a platform to buyers and sellers of services is liable to pay GST on behalf of his suppliers. For example, Ola provides services of transportation of Passenger through Radio Taxis. Then Ola has to pay GST on behalf of actual service provider i.e. Driver. If the e-commerce operator does not have a physical presence in the taxable territory, then a person representing such electronic commerce operator for any purpose will be liable to pay tax. If there is no representative, the operator shall appoint a representative who will be held liable to pay GST. For a person required to pay GST under reverse charge mechanism, it is mandatory for him to be registered under GST and is exempted from the threshold limit of Rs. 40 lakh (Rs. 10 lakh for special category states except for J & K) is not applicable to them. a. Date of receipt of goods. b. The 30th day from the date of issuance of an invoice by the supplier. *If it is not possible to determine the time of supply, the time of supply shall be the date of entry in the books of account of the recipient. For instance, the ‘Date of Receipt’ for the purchased goods is 01/02/2019, ‘Issue of invoice’ is on 21/02/2019 and ‘date of entry’ in the book is 02/02/2019. In this case, the Time of supply is 01/02/2019. Any amount payable under reverse charge shall be paid by debiting the electronic cash ledger. The reverse charge liability cannot be discharged by using input tax credit. 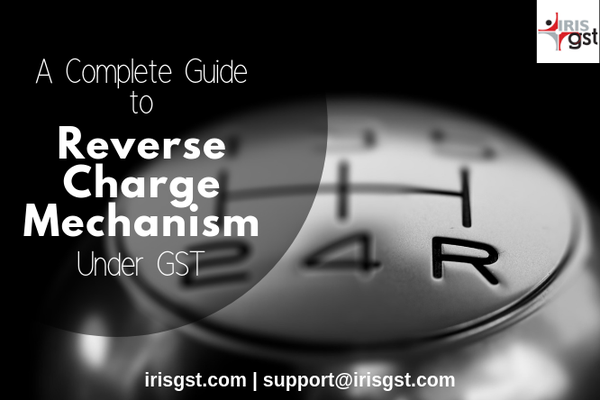 Advance paid for reverse charge supplies is also liable to procure GST. The person making advance payment has to pay tax on a reverse charge basis. Under the reverse charge mechanism, the recipient of goods cannot claim ITC as the supplier has not paid any tax for their sales. Input Tax Credit is available only on the receipt of supplies for which tax has been paid and the supplied goods/services were consumed for business purpose. If a person is not registered under GST, he cannot issue GST compliant invoices. Thus, in such scenarios, the recipient is required to prepare the invoice himself for the purchase made as well as the taxes paid. 7. What if an Input Service Distributor receives supplies liable to Reverse Charge? The ISD mechanism is only to facilitate distribution of credit of taxes paid,. Hence an ISD cannot make purchases liable to Reverse Charge. If the ISD wants to procure such supplies and take the Reverse Charge paid as credit, the ISD should register as a Normal Taxpayer. 8. What if the receiver of goods and/or services who is required to pay tax under RCM himself an Unregistered Dealer? All taxpayers required to pay tax under reverse charge have to register for GST and the threshold of Rs 40 Lakhs/10Lakhs is not applicable to them. Prior to the CGST Act, 2018, purchases up to Rs. 5,000 per day from an unregistered supplier were free from any GST. On the other hand, for purchases exceeding Rs. 5000/ day, the purchaser was required to pay the reverse charge. This requirement has been cancelled from 1st Feb 2019 onwards. Under CGST Act, 2018, only the specified categories of goods and/or services purchased by a person registered under a specified category, from the unregistered person shall be liable to pay the tax on a reverse charge basis. The Government is yet to announce the aforementioned categories of goods/service and registered person for whom the provisions are applicable.